(a) Check the output voltage. Connect the positive (+) tester probe to terminal VG, and negative (-) tester probe to terminal E2G. Blow air into the Mass Air Flow (MAF) meter, and check that the voltage fluctuates. (b) Measure the resistance between terminals 4 (THA) and 5 (E2). (a) Measure the resistance between the terminals. (b) Connect the battery's positive (+) lead to terminal 1 and negative (-) lead to terminal 2, and check the movement of the valve. NOTICE: Confirm that the valve moves freely and does not become stuck in any position. If necessary, replace the OCV assy. HINT: If the valve cannot return properly because of foreign matter, a small pressure leak in the advanced direction may occur and a DTC will be output. (a) Check the acceletor pedal position sensor (see page 05-469 ). 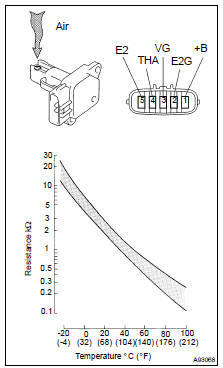 (a) Check the throttle position sensor (see page 05-469 ). (b) Check the throttle control motor. Measure the resistance between terminals 2 (M+) and 1 (M-). Resistance: 0.3 to 100 W at 20 C (68 F). If the result is not as specified, replace the throttle body assy. (a) Measure the resistance between each terminal. NOTICE: If checking the ECT sensor in the water, keep the terminals dry. After the check, wipe the sensor dry. (a) Remove the EFI relay from the engine room J/B. (b) Remove the A/F relay from the engine room R/B No. 2. (c) Measure the resistance of the relay. 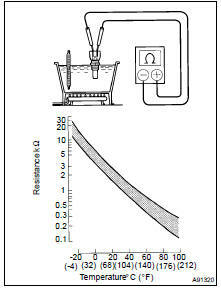 (b) Measure the resistance of the relay.